This lovely home in the Woods of Williams Creek was built in 2003. The homeowners love their backyard space, which offers a private view of the creek behind their property. They wanted to create a screened porch off their second room master bedroom and enclose the existing deck with screen panels for a more enjoyable – and bug-free – outdoor experience for their family. 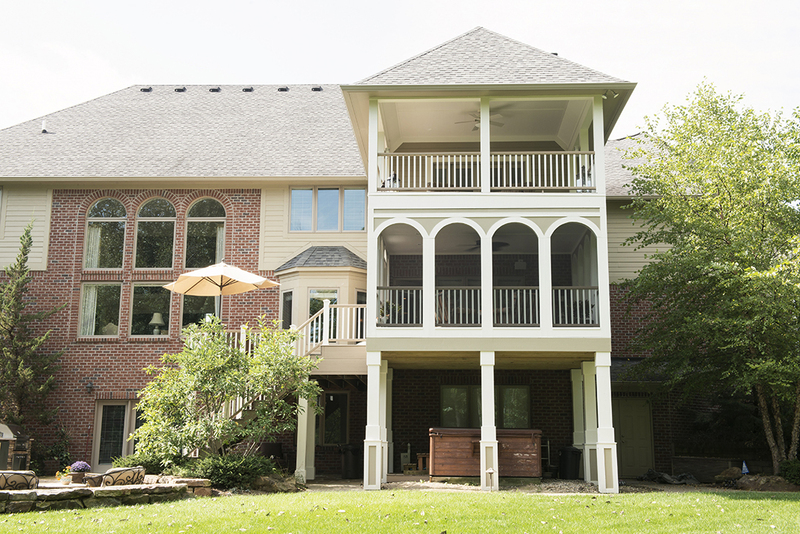 A two-story porch with upgraded patio and firepit provided enhanced outdoor living for the homeowners. Arched screen openings were used on the lower porch to match the arched transom windows in the home. Retractable screens allow the homeowners to use the space in a variety of ways. Tongue-and-groove painted ceilings were added to both levels. The hip roof was extended from the home to create a good architectural transition. New Trex decking and handrail with stone patio and stone veneer firepit finished off the space. To get started on your own remodeling project, visit us at caseindy.com or stop by one of our three locations.